Update: An arrest has been made in this case. Read the story here. A 35-year-old woman jogging in the Logan Circle neighborhood of Northwest D.C. was killed in a brutal stabbing Tuesday evening, and police are still searching for the man who attacked her. Wendy Martinez of Northwest Washington was jogging in the 1400 block of 11th Street NW when she was attacked just before 8 p.m., police say. 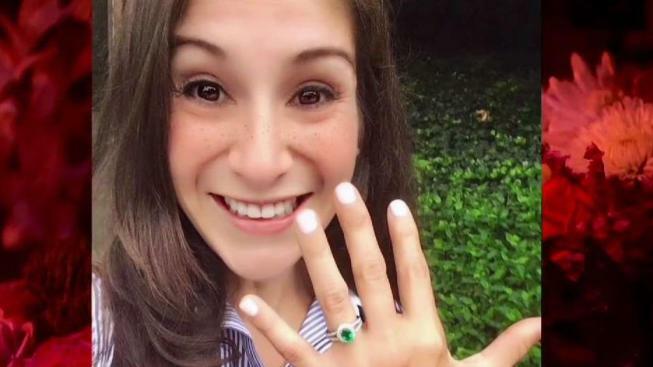 According to her family, she had just gotten engaged a week earlier. News4 obtained surveillance video that shows Martinez stagger into the Asian American Carryout restaurant and apparently plead for help. She collapsed a short time later. Police released surveillance video Wednesday afternoon showing the suspect walking along 11th Street NW. Footage from another camera shows him walking with a knife in his hand. The knife used in the stabbing was found nearby. D.C. police chief Peter Newsham said police do not have a motive yet, but the "unsettling" attack was likely random. Police initially said they were looking for as many as three men in connection to the stabbing, but at a news conference Wednesday afternoon, Newsham said investigators believe she was attacked by a single man. "You have an incident like this — it's very scary. We haven't gotten to the bottom to see if this is someone that she knew or exactly what the motive is, but it's disturbing," Newsham said. The crime rate in the area near Logan Circle is relatively low, with few violent crimes reported, D.C. crime statistics show. A number of upscale homes and trendy restaurants are located near the scene of the crime. The attack left other joggers in the area stunned. Anyone who can help police is asked to call 202-727-9099.